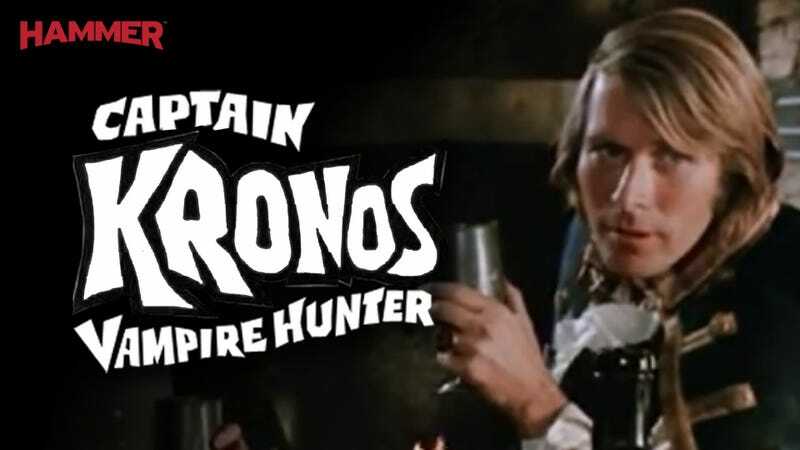 Per CBR, the cult 1974 Hammer film Captain Kronos Vampire Hunter, is due to become the second title released under Titan’s Hammer Horror imprint following the success of Peter Milligan’s The Mummy: Palimpsest. The new ongoing series, just titled Captain Kronos, is expected to launch some time later this year and will be written by Dan Abnett (Aquaman, Guardians of the Galaxy) and drawn by Tom Mandrake (Sidekick, The Spectre). Here’s the official synopsis, though it doesn’t add much in the way of new information. Hopefully we get more extended montages of Kronos checking boxes of frogs buried at the crossroads and trying all sorts of different vampire slaying methods until he finds the correct one that will do a particular vampire in. Titan Comics’ new series chronicles the adventures of the mysterious and powerful Kronos who has dedicated his life to destroying the evil vampire plague. Once a victim himself, the debonair Hunter knows the vampire’s strengths and weaknesses as well as the dangers of confronting the potent forces of darkness. Now the cult-classic adventure continues in comics form! This won’t be Captain Kronos’ first appearance in comics though. There was a whopping 12-page adaptation of the film published in Hammer’s Halls of Horror magazine. You can read the entire thing here.